MIDI: an amazing standard for interconnecting musical instruments. It's hard to believe it was created over 30 years ago, but it's true! Still very much an essential for musicians around the world, MIDI allows any MIDI equipped instrument, sound module, FX processor, lighting rig etc to talk to one another. MIDI's amazing flexibility has ensured that it's remained an industry standard through the decades. It's an extremely simple and reliable form of digital control signal, which can be handled with ease by any modern equipment. When you think of MIDI, you probably think of the classic MIDI port, the DIN socket. Originally designed for Hi-Fi connections, DIN sockets and plugs were adopted by the original designers of MIDI. Each pair of DIN-MIDI sockets represents one MIDI port and each port can carry up to 16 MIDI channels. Of course. MIDI interfaces such as the iConnectivity mio4 allow for multiple MIDI ports; in the case of the mio4, it features 4 sets of MIDI ports, each with its own set of 16 channels. As MIDI is such a simple protocol (by modern standards anyway), it's relatively easy to run MIDI data over other connection methods. One of the most common methods and one which has become almost the de-facto standard in recent years is USB MIDI. You probably hear the term bandwidth being used a lot in music technology, but what does it mean? Well, when we're talking about digital data, bandwidth refers to the amount of data that can be crammed down a connection in a given period of time. Thanks to the advances in technology over the years, USB has considerably more bandwidth capability than the traditional DIN MIDI connection method. As a result, just a single USB connection, down a single USB cable can emulate up to 10 virtual MIDI ports! Old though it may be, DIN-MIDI connections can be run as far as 6 metres (20 feet), and even up to 15 metres (50 feet) or more with quality cabling. USB on the other hand, was designed for connecting computer peripherals over relatively short lengths. This can be a huge problem on stage or in large studios. You may not be aware of it, but chances are you're using that connection standard right now. Ethernet has been around as long as MIDI itself and was originally created to network computers. From the offset, Ethernet was designed to work over long distances and using cheap, readily available cabling. At iConnectivity, we recognized how useful it would be to allow the transfer of MIDI over ethernet. Take a look at the iConnectivity mio4, mio10, iConnectMIDI4+, or even the PlayAUDIO 12, and you'll see each of them has an Ethernet jack on board (that’s the square jack with the <•••> logo above it). Yep, that's right! Each of these iConnectivity devices isn’t just a USB interface, they are Ethernet MIDI interfaces too! RTP-MIDI is built into all MacBooks and iOS devices as standard. RTP-MIDI can also easily be added to Windows computers with the special iConnectivity RTP-MIDI Windows driver. Chances are, you probably already have a system at home that's RTP-MIDI ready. Ethernet is a very fast transmission system, with a lot of bandwidth; just like USB, it can carry multiple virtual MIDI ports. All current iConnectivity Ethernet interfaces are capable of transmitting and receiving over 4 virtual MIDI ports, each with 16 channels. If you find yourself needing more than 4 virtual MIDI ports, simply add another interface to your network to give you 4 more virtual MIDI ports each time. RTP-MIDI also has built-in latency compensation, so timing is super tight, no matter how many MIDI devices you are running. So, how do you go about connecting up an RTP-MIDI setup? Well, if you've ever setup a home computer network, it'll be pretty easy for you. If you haven't, don't worry, we'll guide you through! RTP-MIDI runs over the Internet router in your home or any standard Ethernet switch, using any normal Ethernet cable. You can plug an iConnectivity Ethernet interface directly into your computer’s Ethernet jack, but it’s usually better to plug in via an Ethernet switch or router for maximum flexibility. RTP-MIDI will also run over an Ethernet network using HomePlug adaptors! HomePlug adapters are amazing things that enable you to run Ethernet through the walls of your building using the mains cable and sockets, already installed in your home. Plug the adaptors straight into your power sockets, plug an Ethernet cable into each one and you instantly have Ethernet MIDI running between them. Imagine a whole MIDI network running throughout your home, or your studio, without laying a single cable. No more mess, no more expensive cabling. Genius! HomePlug adaptors - create an RTP-MIDI Ethernet connection anywhere there are two connected power sockets! Imagine a band playing a large stage: The keyboard player is stage right, the drummer stage centre, with their computer and playback stage left (or even off to one side of the stage). The keyboard player is playing softsynths, the drummer is using a drum pad to trigger playback start/stop, and the playback computer is receiving all of that MIDI information. Using Ethernet MIDI allows for the keyboard player, and the drummer, to connect to the playback computer using just a single ethernet lead, each. It's cheap, simple and robust, and means the computer can sit off to the side of the stage, with its audio outputs connected directly to FOH. This is a straightforward situation with iConnectivity interfaces. The keyboard player plugs her USB or DIN MIDI controllers into the mio4. The drummer might have another mio4 connected to his MIDI drum pads, and via Ethernet both would connect to a PlayAUDIO12 connected to the computer. Of course, being able to run MIDI over very long distances, down an Ethernet cable, opens up huge possibilities for show control. Dion Friely, Musical Director for Kendrick Lamar, uses an iConnectMIDI4+ with a connected iPad, to control the entire show. That's playback, lighting, pyrotechnics, the whole shebang! Follow this link for a detailed easy to follow tutorial on how to set up an RTP-MIDI network. 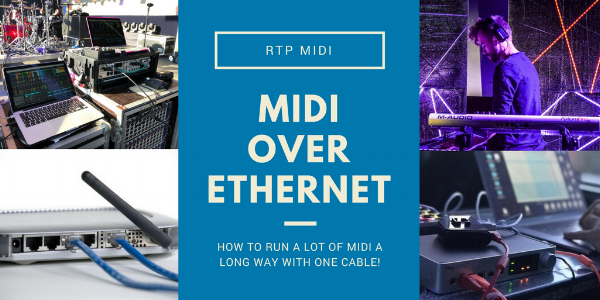 If you've never set up an RTP MIDI network before, or you're intrigued at the possibilities it could open up for you, take a read. Many of our endorsees choose iConnectivity interfaces because of their ability to run MIDI across the world's stages, reliably, simply and easily. The next time you're at a gig where there's MIDI, the chances are it'll be an iConnectivity interface running RTP-MIDI. Isn't it time you gave it a try?